Today, Ransomware attacks are more destructive than ever before. No organization, too large or small is safe from a potential attack. 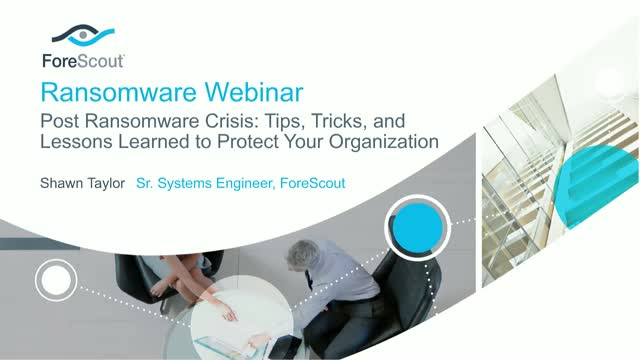 Watch this webinar to hear from our security solution expert, Senior Systems Engineer, Shawn Taylor to discuss recent ransomware breaches, the impact of those breaches, and steps you can take to better protect your organization from falling victim. In addition, you’ll discover how ForeScout’s security platform provides visibility into what’s on your network in order to and assist in identifying the potential risk that exists in your environment today. Shawn Taylor, Sr. Systems Engineer ForeScout Technologies, Inc. Presented by: Shawn Taylor, Sr. Systems Engineer ForeScout Technologies, Inc.